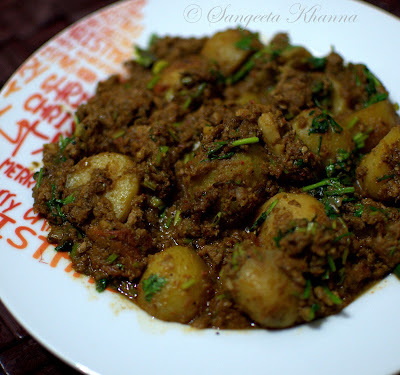 banaras ka khana: alu dum with chicken keema | keema alu dum.. The fact is, the new potatoes of winters are the best suited in Alu methi that I normally make like Kela methi, Alu saag and so many other winter subzis like alu sem and alu gobi. A bengali style Alur dom (aloo dum) is a favorite too and goes well with the motorshuttir kachuri (green peas kachori). I make a keema wala gobi musallam too. It is a much loved recipe in my home.This keema aloo dum is another way to enjoy the wonderful taste and texture of winter potatoes with a spicy meat mince gravy. Very much a winter dinner when accompanied with hot chapatis. to make a rough paste..
to make a smooth paste..
Heat the oil and tip in the cumin seeds and wait till they crackle. Slide in the halved potatoes, sprinkle a little salt, just for the potatoes, and stir fry them on medium heat. The potatoes being used should be boiled and cooled down as mentioned in the ingredients list, as these will be cooked for a long time, along with the mince meat too, and you don't want them to disintegrate. If you use them hot or warm, they would start breaking in this step itself. So be careful about this. Low flame, added salt and frequent turning will ensure slow frying of the potato halves in a less quantity of oil. While you stir fry the potatoes, making them golden brown from almost all sides, make the first paste. Drain the fried potatoes from the oil and keep aside. Add the remaining oil into the same pan and pour the first paste into the hot oil. Add salt to taste and keep stirring till the paste starts getting pinkish. Make the second paste meanwhile and add at this stage. Now is the time to bhuno the mixture on medium flame by scraping the pan and mixing the masala various times. The masala paste gets brown in color, aromatic and shining in appearance when it is ready. Now is the time to add the chicken mince (or mutton mince if using) and bhuno again. The mince starts getting white and cooked. Let it cook for about 5 minutes, stirring all this while make the tomato paste alongside and add in the last. Bhuno again for about 45 minutes and add 2 cups of water and the fried potatoes. Simmer on low flame, covered for about 20 minutes or till the desired consistency is reached. Add the chopped coriander to finish and serve hot with hot chapatis or naan. 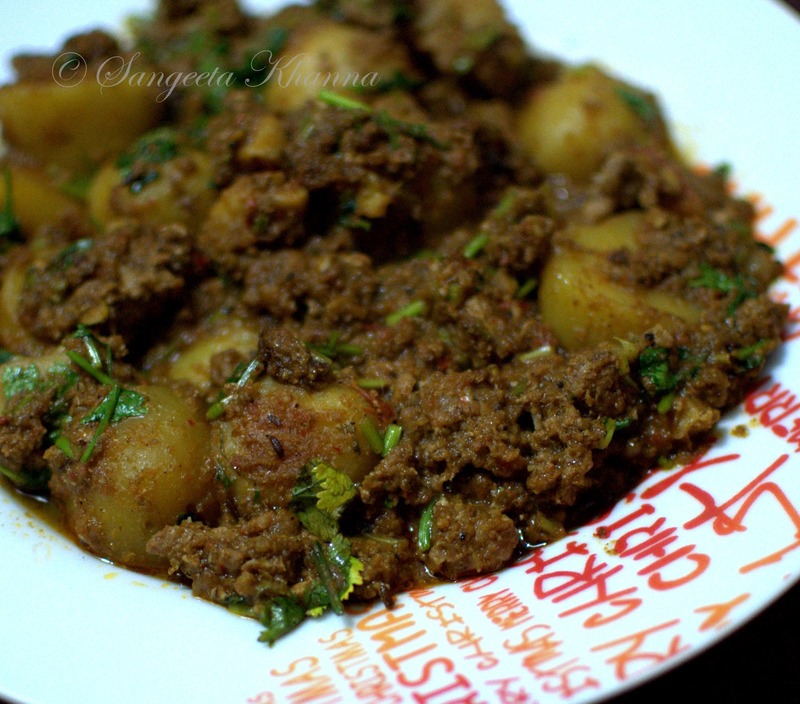 A deep spicy flavor with warmth of mustard oil, perfect winter baby potatoes and some mince is all one needs after a day's work. Coriander greens make it really refreshing. As I'm writing...I'm drooling. Can't wait to try this over the weekend. You actually had me at the title of your blog....Benaras is a city that has been on my 'to-visit' list ...espcially for their food.